Qualitative researchers are interested in evaluating, interpreting and explaining social phenomena. They analyze data like interviews, surveys, field notes, web pages, audio visual material and journal articles. Researchers usually adopt a qualitative methodology to suit their research question. For example, a social scientist wanting to develop new concepts or theories may take a ‘grounded theory’ approach. A researcher looking for ways to improve health policy or program design might use ‘evaluation methods’. NVivo doesn’t favor a particular methodology—it’s designed to facilitate common qualitative techniques no matter what method you use. 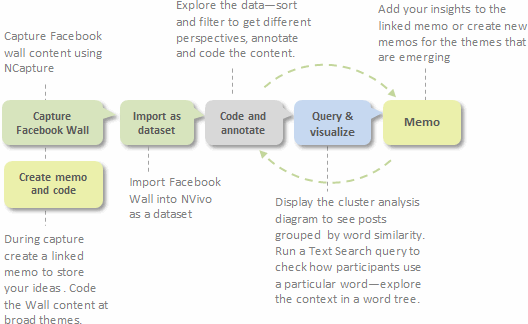 NVivo can help you to manage, explore and find patterns in your data but it cannot replace your analytical expertise. How do I choose the best approach for my project? Every research project is unique—the way you organize and analyze the material depends on your methodology, data and research design. This page presents some example scenarios for handling different types of projects—these are just suggestions to get you up and running. Feel free to share your own ideas and strategies on the QSR Forum. Your files consist of unstructured interview documents. You would set up a case node for each interview participant, then code to theme nodes and case nodes. You could then explore your data with simple queries or charts, and use memos to record your discoveries. Your files consist of structured, consistently formatted interviews (where each participant is asked the same set of questions). You could auto code the interviews and set up cases for each participant. 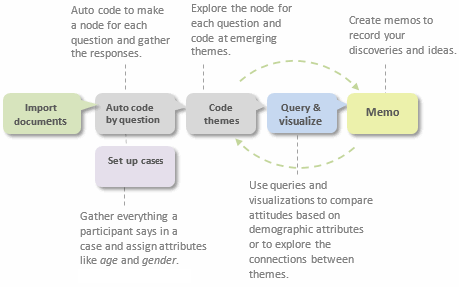 Then code themes to query and visualize your data. Your files consist of journal articles, books and web pages. You would classify your files before coding and querying them; and then you could critique each file in a memo. Your files consist of in-depth interviews and observation notes. 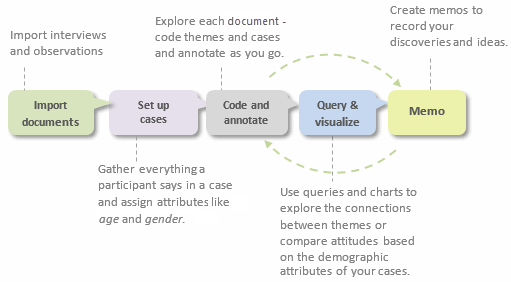 You would set up cases and code themes before querying your data. You could then summarize the material in a framework matrix to compare attitudes. Your files consist of Facebook data captured with NCapture. You would import it as a dataset ready to code and query. Use memos to record your insights. Your files consist of in-depth interviews and observation notes. You would set up cases and then create relationships between them, so that you could visualize social networks using egocentric and network sociograms. Your file is a large dataset of survey responses. You would import it using the Survey Import Wizard, which prepares your data for analysis. As part of the import, choose to run automated insights to identify and code at themes and sentiment so that you can quickly review results and report broad findings. Start now - don't wait until you have collected all the data. Import your research design, grant application or thesis proposal. Make a project journal and state your research questions and record your goals. Why are you doing the project? What is it about? What do you expect to find and why? Make a mind map for your preliminary ideas. Show the relationships or patterns you expect to find in your data based on prior experience or preliminary reading. Import your interviews, field notes, focus groups —organize these files into folders for easy access. Set up an initial node structure based on your early reading and ideas—you could run a Word Frequency query over your data to tease out the common themes for creating your node structure. Set up cases for the people, places or other cases in your project. 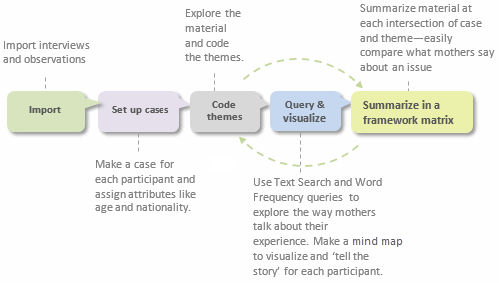 Explore your material and code themes as they emerge—create memos and describe your discoveries and interpretations. To protect your work, get in the habit of making regular back-ups. 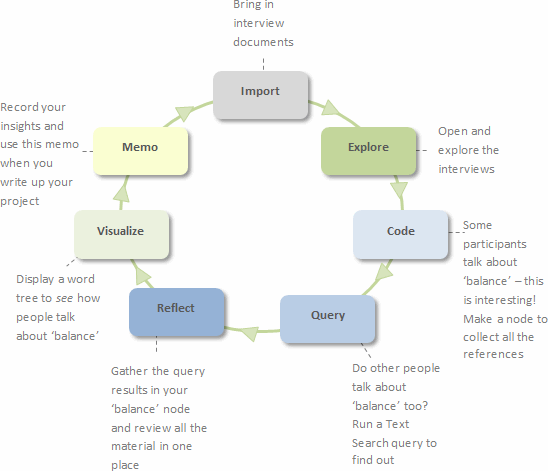 Demonstrate the evolution of your ideas in memos and maps. Document your early preconceptions and biases (in a memo or map) and demonstrate how these have been acknowledged and tested. Always return to the original context of your coded material. 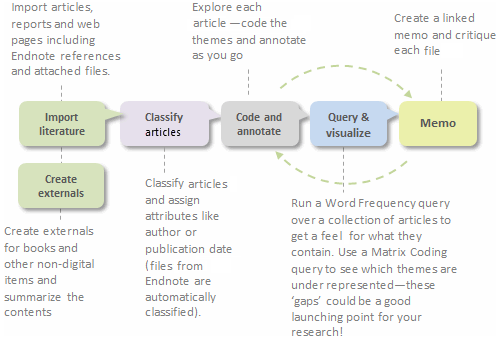 Save and revisit the queries and visualizations that helped you to arrive at your conclusions. If you used NVivo for your literature review, run a query or create a chart to demonstrate how your findings compare with the views of other authors. Was an issue or theme reported by more than one participant? Run a Matrix Coding query to see how many participants talked about a theme. Were multiple methods used to collect the data (interviews, observations, surveys)—and are the findings supported across these data files? Run a Matrix Coding query to see how often a theme is reported across all your files. If multiple researchers analyzed the material—were their findings consistent? Use coding stripes (or filter the contents in a node) to see how various team members have coded the material and run a Coding Comparison query to assess the level of agreement.